Does your knee prevent you from performing and enjoying everyday activities? Osteoarthritis affects nearly 350 million people worldwide.1 It is a common condition in which cartilage breakdown around the joints causes your bones to rub together, and it is especially common in the knee joint, which carries most of the body’s weight. Symptoms include pain, swelling, and changes in appearance and function of the joint – which can contribute to loss of motion. If other treatments, such as medication, therapy or injections, have proven ineffective, a total knee replacement may be the best way to get your life back. Your knee joint is cushioned by cartilage that covers the ends of the thigh bone (femur), top of the shin bone (tibia) and the knee cap (patella), helping them to move smoothly against each other. But when this cartilage wears down and your bones begin to rub together, it can cause severe knee pain that reduces the function of your knee. 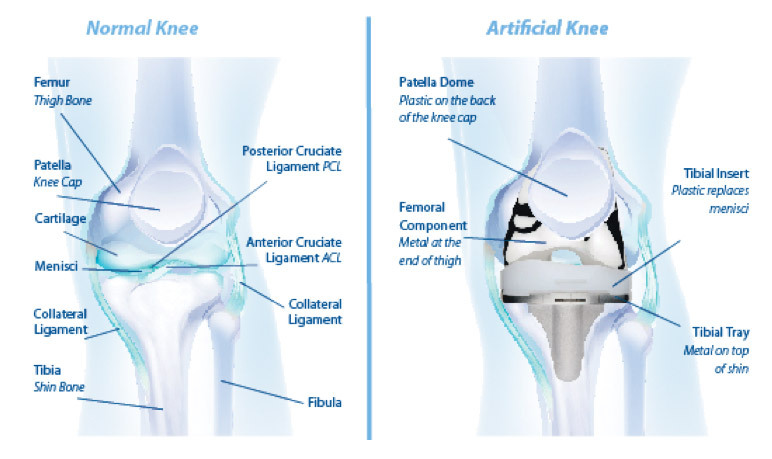 The goal of total knee replacement surgery is to replace this damaged bone and cartilage with smooth metal and high-grade plastic that recreate the surface of your knee joint. These new surfaces are designed to replicate the function and feeling of a healthy knee while also preventing the pain caused by damaged bones rubbing together. Total knee replacement is one of the most successful treatments to restore knee function and stop pain. Traditional knee replacements have been shown to feel unstable and move in an unnatural way2. Medial-Pivot knee implants were designed to address these limitations, providing patients with a natural-feeling implant that works like a healthy knee3. Traditional implants are shown to decrease stability by sliding forward during everyday activities.2-3 But a normal knee pivots on its inner (medial) side. And when the knee bends, the outer (lateral) side rolls back, while the medial side rotates in one place4. Figure 1. This is precisely how a Medial-Pivot Knee implant was designed to move, and how it received its name – by replicating the bending, rotating and twisting of a healthy knee3. This ball-in-socket design maximizes stability throughout range of motion, and allows patients to walk down stairs, and complete other daily activities with confidence8. Figure 2. Studies have shown that instability is the leading cause of early revisions.5-6 Traditional implants cause instability during everyday activities like walking down stairs, bending, and squatting due to the limitations in their design. Medial-Pivot Knee Replacement: a function enhancing implant! The quadriceps muscle is a large muscle group that includes the four prevailing muscles on the front of the thigh. Also called quadriceps complex, it is crucial in daily life activities such as walking, running, jumping and squatting, since it is mainly responsible for the knee extension. 3. Schmidt R, Komistek RD, Blaha JD, Penenberg BL, Maloney WJ. Fluoroscopic analyses of cruciate-retaining and medial pivot knee implants. Nov 2003, (416):37-57. 7. Pritchett JW. Patients prefer a bicruciate-retaining or the medial pivot total knee prosthesis. J Arthroplasty. 2011; 26(2): 224-8. Individual results and activity levels after surgery vary and depend on many factors including age, weight and prior activity level. There are risks and recovery times associated with surgery and there are certain individuals who should not undergo surgery. Consult your doctor to determine if surgery is right for you.